Welcome to Bearadise, a secluded and whimsical bear-themed cabin just minutes from Alpine Helen! The covered front porch with rockers, the wrap around deck with stairs down to the fire pit, and the screened in back porch with hot tub, all make Bearadise the perfect choice for a family of 8 or 4 couples! The interior of Bearadise is both beautiful and unique. The re-purposed metal used on the bedroom walls, the creative bear carvings and even the paw prints on the floor give this awesome cabin an upscale, naturally rustic feel. The Mountain Laurel curtain rods, and burlap curtains just add to the charm! The exterior of Bearadise is wonderful as well. 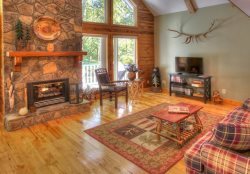 The covered front porch is outfitted with comfy rocking chairs, and an open wrap-around deck with stairs leads down to the fire pit with natural log seating and camp-style charcoal grill. The screened porch off the back with hot tub, whimsical bear carvings, and gas BBQ grill complete the outdoor experience! Bearadise is a mere 5.5 miles to the Bavarian village of Alpine Helen, yet offers a “worlds away” setting hidden at the base of Mt. Yonah. The best of both worlds – restaurants, activities and all that Helen has to offer, then escape to Bearadise for rest and relaxation, or keep the fun going and with a campfire and s’mores! For the wine connoisseurs in your group, Bearadise is also conveniently located to several of our incredible local vineyards and wineries -- just 3.5 miles to Serenity Cellars, an easy 6-mile drive to Yonah Mountain Vineyards, and just 8.5 miles to CeNita Vineyards! No matter what you’re interest, Bearadise is the perfect home base for all your adventures!